The MRG industrial water softener system offers a corrosion resistant alternative for industrial applications. 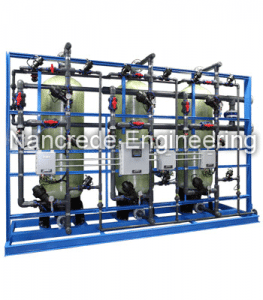 Equipped with industrial grade FRP resin tanks and external control valve manifold, it achieves higher service flow rates than traditional top-mount, multi-port valve configurations. All systems are completely factory skid mounted, pre-piped, pre-wired, and pre-tested for minimal installation time and cost. Standard designs available for twin and triple tank configurations.